It’s the first week back of a new semester. And the New Year often brings with it much change. In the busyness that is January, I’ve taken a moment to reflect back on my linguistic journey. I hope you enjoy. 1995: My first word, “Papa,” French for father. 1995: English is my first language. 2006: In the sixth grade, we learned the bilingual version of the Canadian national anthem. I still have no idea what any of the French lines mean. 2012: I began university, majoring in Classics, studying Latin and Ancient Greek. 2016: I took my first trip overseas to Rome, where I spent five weeks studying Latin with The Paideia Institute. In the same trip, I visited my family in Boiano for the first time. I spoke no Italian, so I used what I knew of Latin and fudged the endings to get by. 2017: I met a boy. A German boy. His parents didn’t speak English, so I figured I should learn German. My favourite band is Rammstein, so I didn’t need much convincing. (I’ve seen them in concert before, but I hope one day to meet them!). Though we’re not together anymore, I fell in love with German and it continues to be one of my most fervent passions. This summer (2019), I plan to take a trip to Scandinavia, where I hope to take a ballet class with the Royal Danish Ballet School. 2018: I took my first six weeks of Mandarin lessons in January of that year and I loved it! In the future, I hope to earn a Ph.D. in Linguistics, and become fluent in multiple languages. How have the languages you speak shaped who you are today? I speak Latin, German, and some Mandarin. I get really excited about words and their origins, and how we can use them to express some of the most beautiful ideas. As I become more comfortable expressing myself in other languages, I become more aware of what’s important to me. The words I actively seek out enable me to share who I am with other people. Figuring out what words and ideas I want to express in another language has been paramount in helping me to figure out who I really am. How do they shape you as an ESOL teacher? As a language learner, I understand firsthand the challenges and rewards that language learning brings, both on a personal and professional level. I feel best suited to teaching in an academic environment, because I see how formal language training can shape people in terms of helping them discover their identity, improving their critical thinking skills, enabling them to make connections beyond themselves, and so much more. What are the things you know/care about or don’t know/care about because of the language(s) you speak? In my language learning journey, I’ve come to learn how to be a better communicator. I’ve come to care about having the ability to connect with literally any human on this planet. I want to learn more about the fundamental qualities that connect all of us. I want the world to hold infinite possibilities. Sweet Dreams are Made of…German? And when you hit the ground, you wake up. Or, you’re about to get on a bus in Berlin, and you need to ask the bus driver how much the fare is. So you turn to your German friend to save you the trouble, except they refuse to do the interaction for you. Annoyed, you roll your eyes, and as you turn back to the bus driver, you blurt out: “Wie viel kostet das?” The driver replies, and as you dig through your wallet for €1.70, your mind starts racing: “Did I just ask the driver, in German, how much the bus fare was? And he understood me?! But I don’t even know how to ask how much bus fare is in German! Wait…why am I in Germany?” You blink, and when you open your eyes, you realize that you missed your stop at the Reichstag and you’re back in Toronto. I’ve been studying German for a year now, and about six months ago, I had my first ever dream in German. At the time, I wasn’t exactly fluent in the language, but I had just come back from a trip over there. I haven’t dreamed in German since, but I’ve wondered what dreaming in another language really meant. Does dreaming in another language demonstrate a mastery of material? Does it represent an unconscious ideal of fluency? Are the dreams a recycling of linguistic input that your conscious mind didn’t catch, but your subconscious did? What happens to people who fall into comas and wake up speaking with an accent or speaking a different language entirely? Is this the same thing? Do you know another language? If so, have you dreamed in it? If you don’t know another language, have you ever dreamed in one? Photo courtesy of Christophe Hautier from Unsplash. What is the most uncomfortable thing that’s ever happened to you in a classroom? Have you ever come across a quiet group of learners who, due to shyness or uncertainty, remain silent when you ask them questions or address them? Have you yourself been a quiet student? With such a diverse group, these students often bring with them a variety of experiences, some of which may not be so positive. Monica Waterhouse writes about the implications of students sharing experiences of violence in the ESL classroom. Waterhouse’s research stems from her own personal experience as a teacher in a LINC classroom. She recalls, when teaching the Canada Food Guide, a woman who commented that she no longer eats red meat. When Waterhouse asked if the woman was a vegetarian, the woman replied that she no longer ate red meat because it brought back memories of witnessing her husband’s murder. In response to hearing such stories of violence, students often feel upset or surprised, and may relate those experiences of loss to feelings about loved ones in their own lives. Waterhouse notes that based on these reactions, discussions about experiences of violence offer an opportunity for “critical affective engagement” — an important pedagogical tool that provides learners opportunities to self-reflect and to sympathize with others. The “transformative and pedagogical potential of violent stories” suggest that these stories do, in fact, have a place in the classroom. Through listening to other people’s experiences, we become more aware of the world around us. Through discomfort, we learn to grow. Through sadness, we learn to sympathize. Through discussion, we are given the opportunity transform. The best thing we can do when hearing about violence in our classrooms is to simply enjoy the silence. For out of the silence of self-reflection, both ourselves and our learners have the potential to become more aware of the world around us and how to get along with everyone in it. TESL: Teaching English as a Second Language, or in a country where English is an official language. TEAL: Teaching English as an Additional Language, or in a country where English is an official language. This term is used primarily used in the UK. It is the same thing as TESL. TEFL: Teaching English as a Foreign Language, or in a country where English is not an official language, and/or not widely used. TESOL: Teaching English to Speakers of Other Languages. A certificate that allows you to teach both in your English-speaking home country or abroad. At the end of the TESOL program, some students may go on to teach ELLs of various CLB levels in a LINC class using CLT and PBLA. Others may choose to teach EFL in Asia to prepare their ELLs for the TOFEL or IELTS exams. I think I’d like to pursue a Linguistics degree and learn more about how a learner’s L1 influences SLA. Which bowl of alphabet soup appeals to you? Two years ago, I had the opportunity to participate in a study abroad program with The Paideia Institute in Italy. 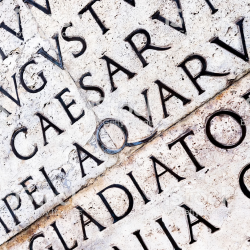 I spent five weeks in the Roman heat living, breathing, and speaking…Latin. Yep, that’s right. Latin. Why, you might ask? Well, as a third-year Classics major, I couldn’t pass up the chance to finally speak the language I had been so dutifully studying for so long. Hours and hours spent conjugating verbs and declining nouns, forming comparatives and superlatives of adjectives and adverbs, memorizing the 30 relative pronouns, sussing out which of the 112 cases of the ablative was being used (such fond memories…). So, naturally, after years of rote memorization, I was excited to finally put it to use! Except I couldn’t. Those five weeks were the most challenging five weeks of my life. Mentally drained from the language and physically drained from the heat, I squeaked by in the shadow of my Harvard and Princeton counterparts. My peers weren’t better at Latin than I because they went to Ivy League schools. No, they were better at Latin because they already had years of experience speaking it. The Eastern United States has taken a renewed interest in Active Latin in recent years. (Active Latin programming seeks to incorporate spoken Latin in the classroom. Renaissance 2.0, anyone?) Students are learning Latin as young as Kindergarten out there. I didn’t even know Classics was a discipline until I got to university. I remember asking a classmate a few weeks into my first ever Latin class why we hadn’t been doing any speaking. She reminded me that this course was titled “Introduction to the Reading of Latin, Part I.” I remember thinking, “How am I supposed to learn the language if I don’t know what it sounds like?” And was I right. I know that the only way to get better at Latin is to begin by producing output. Reading Latin in a cave with my fellow Paideians. Semi-literate and non-literate learners live in literate societies, but respectively possess little to no literacy skills (broadly, the ability to read and write). Pre-literate learners may not understand that print conveys meaning. That description of pre-literate learners absolutely blew my mind. “Well of course print conveys meaning…” I thought to myself. I was aware of illiteracy as a social problem, either due to lack of access to education, or failure at an institutional level, but I had no idea there are entire cultures where written forms don’t actually exist. I had so many questions. What challenges do literacy learners face? What strengths do they bring to the table? What do their brains do differently than ours from a neurological perspective? But most importantly, how are we to teach literacy learners who come from societies with strong oral traditions? Well, as I recently found out, we use their oral skills to support their written skills. This week, a classmate introduced me to a classroom approach for literacy learners where learners create stories that you transcribe and then all work through together. In the Language Experience Approach, the instructor elicits a story about a personal experience from the learners (perhaps about a shared experience, like a recent field trip). The instructor asks the students to speak aloud: what the experience is about, what happened first, what happened next, how they feel about the experience, etc. As the students are speaking, the instructor writes down the story on the board, without making any corrections. (To immediately correct the learners only serves to frustrate them and belittle their efforts.) When the story is finished, the instructor and the learners read the story aloud (through paired or echo reading). Oftentimes, the learners will go back and correct plot or grammatical elements of the story themselves. The success of the approach lies in its ability to help pre-literate learners make connections between the spoken and written word. Colleen Shaughnessy offers eight techniques and methodological suggestions for teaching pre-literate learners. Her suggestions can be viewed here, and, for another interesting read, her master’s thesis can be viewed here. Photo courtesy of Green Chameleon from Unsplash. Look! It’s a blog within a blog. Just wait for more bloggery down below! How can blogs be used with ESL learners to facilitate language learning? An instructor might like to have students create and use blogs as part of their class in order to facilitate language learning. There are tons of different sites to choose from (WordPress, Wix, and Squarespace, just to name a few), that offer both free and paid plans, depending on the level of customizability you want. Before creating a blog, learners should begin by reading through other blogs. This will help familiarize them with the different styles, approaches, and set-ups they can use for their own. Blogs facilitate language learning in two ways: through reading and through writing. Merrill Swain suggests that the best way for a learner to acquire another language is to produce comprehensible output. Since writing is a productive skill, blogging is a great way to produce comprehensible output. The more a learner writes, the better writer they become. However, Swain also recognizes the importance of comprehensible input in SLA, for if there were no input, there could be no output. Therefore, language learning is also facilitated through reading other blogs: both from classmates and from others. The more a learner reads, the better reader they become. Due to their somewhat technical nature, blogs are best suited for intermediate to advanced students. Should an instructor decide to have students use blogs as part of their class, it would be an excellent choice to facilitate language learning and to help the learners develop their language identity.